A mundane bathing experience can be spiced up with a rainbow experience under an LED shower head. Energized by small impellers or turbines, a Light Emitting Diode (LED) shower adds excitement and color to your daily bath routine. 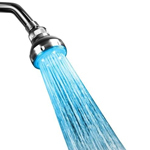 In advanced color changing shower head, the light color changes from hues of blue to brighter tones of red, often to exhibit the temperatures of the shower water flow. Where the cold blue glow is for a cool shower, the red one warns about stepping into a hot shower. As one gets accustomed to best LED shower heads, the mere lighting glow is an enough indicator about the temperature level for you to step into the shower. Well, bathing could not get cooler than that! Basic models of LED showerheads may just have random colors for shower light. Others may emit as few as 1 or 2 to many as all rainbow colors. 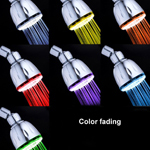 LED showerheads featuring multiple colors may emit different colors separately, at once or according to the temperature of the water. 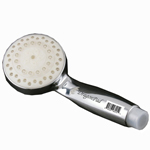 Selecting a durable and easy to operate Lighted shower head could be tricky. Here we help you in making the right choice for getting to enjoy a romantic shower in color and lighting. Basics: What exactly is an LED Showerhead? 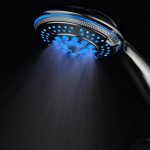 An LED shower head is much like a typical showerhead with the addition LEDs and small turbines or impellers connected to a microcontroller and temperature sensor. A light up shower head may or may not require batteries. Those without batteries, use the water pressure to generate enough power (through turbines) for lighting up the LEDs. Microcontrollers control the kind of light the LEDs in a showerhead will emit depending upon the temperature sensed by the sensor. The tiny turbine in a self-powered showerhead turns when the water from the hose lands on them; so, it can sure generate a bit of noise. Depending upon the make and quality of the LED rainfall shower head, the noise can be anywhere from barely audible to slightly audible and even loud enough to make you want to switch to a standard showerhead! Choose wisely when you scan through different product pictures and descriptions. Keep in mind that not all shower heads with light have temperature sensors. Some may just cycle through different colors of the rainbow and others may emit just one or a handful of colors in a random manner. It pays to check the product description before you assume blue colored spray of water to be cold or red colored spray of water to be hot the next time you step inside the bathroom to get a shower. Plus Points: What are the Key Benefits of LED Shower heads? Color Changing showers are fun. A nice morning or evening shower can sure lift your mood and even shift you to a different mental plane altogether for a brief span of time; a place where all is well. You feel that on some days, don’t you? 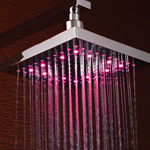 Colorful lighted showers with illuminated shower head can refine that experience. No unpleasant surprises. Not anymore. Advanced LED shower heads show visual cues to let you know just how hot or cold the shower water is. So, the next time you wake up at 6 a.m. in the morning and head straight to the bathroom for a morning shower, you can be dead sure that there will be no unpleasant surprises in store for you; ice cold water shocking you awake – no, that won’t be happening anymore. Know which colors suit you best. After you have had few showers under an LED showerhead, you will have a fairly good idea of which colors (indicating the optimal water temperature you prefer) suit you the best. You will no longer need to touch the spray of water time and again to confirm if the water temperature is good enough for you or no. Turn On the shower and wait until you see the right colors. That’s all. A trendy bathroom. A colorful shower, lighted up by self operated or battery run LEDs can sure add that trendy edge to your bathroom’s aesthetics. You can even shower in the dark! Colorful spray of water will illuminate the shower area for you. A bit of romance. Set the mood on special days with a colorful shower or do it for someone special you want to surprise. Selection: How Should I Choose an LED Showerhead? Consider the power mechanism. Is it self-operated or a battery run showerhead? Self-operated showerheads save you the trouble of replacing batteries but the turbines in such models can sure create some noise. If it is a self-operated showerhead you are considering, go for a high quality model of LED showerhead; it’s more likely to have effectively dealt with the noise problem. Are there any visual Cues? Does the showerhead emit light according to the water temperature or does it just cycle through rainbow (or fewer) colors? Do you just want a LED lighting show in the shower area or you want everything a fine LED showerhead can offer? There are more components. An LED showerhead may have different components such as a battery, turbine, micro-controller, temperature sensor, LED, etc. So, the chances of a poor quality LED showerhead disappointing you after regular use for some time are high. Choose an LED showerhead after having read the consumer reviews. You may also want to consider the brand. How easy is the installation? Most LED showerheads can be installed easily as they can be mounted on top of existing (standard) showerheads. But, that may not always be the case. Read through the product description to find out. An average American spends at least thirty five minutes in bathroom every day. The MagicShowerhead 7 Color LED Shower Head it seems has been specially designed to make that half an hour full of fun and relaxation. No kidding! The showerhead promises to convert your bathroom into a spa; suddenly, your shower area becomes the space where you can wash off not just dirt and muscle soreness but also your mental fatigue. The MagicShowerhead is great for families with young children who are not too fond of taking a shower. Well, just about every other child dislikes the idea of taking a shower in the beginning. But once kids see colorful shower head, they will perhaps need no more persuasion. And they also get to learn the names of the colors, namely, red, pink, green, blue, white, orange and yellow. 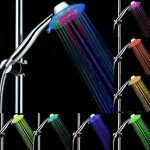 If you want to add a little drama to your bathroom, you may want to go for the MagicShowerhead 7 Color LED Shower Head. It’s fun. If your children feel stressed out about a bath or fear water, you really need to get a little creative with your selection of bathroom accessories. 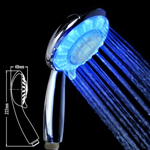 How about you consider the LED Color Changing Showerhead from ShowerDoorDirect? Kids are going to love it, really! Even if you don’t have kids, but are bored of monotonous showers, this showerhead can add that much needed fun element. By just spending around $40, you can make a unique addition to your bathroom. Your showers will become delightfully unusual and different.